Maeil Business Newspaper is reporting that a bidding battle is ensuing between Amazon, Comcast, and EA for Maple Story and Lawbreakers publisher Nexon. Six companies/firms are supposedly in talks to buy the MMO publisher. The full list of possible buyers includes Netmarble, Kakao, MBK Partners, Amazon, Comcast, and EA. The Seoul Economic Report, in a separate report via Reuters, said the Nexon Founder Kim Jung-ju and associated parties want to sell a 98.64% controlling stake of the company. Mobile game publisher Netmarble supposedly has interest in a deal that could be worth $9 billion. EA, Amazon, and Comcast have also submitted bids, according to the report, but numbers have not been disclosed. EA, Amazon, and Nexon declined to comment to Reuters, and Comcast has not responded to requests for information. 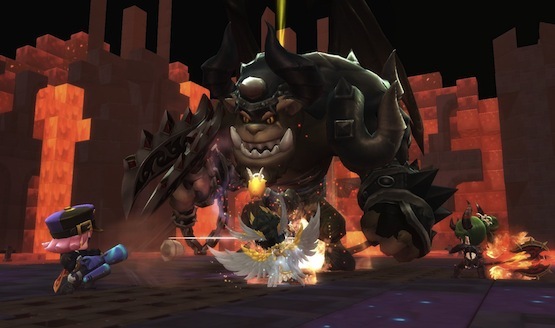 Nexon—which was founded in 1994—supports over 80 games in more than 190 countries with a focus on MMO titles, such as Maple Story, Dungeon & Fighter, Elsword, Grand Chase, and Vindictus. The company also published Boss Key Productions’ Lawbreakers, which had its servers shut down late in 2018 after failing to garner enough of an audience. Boss Key Productions also closed in 2018. EA, one of the reported bidders, recently released Apex Legends, the latest battle royale craze game that has amassed over 25 million players over the span of its first week. However, its newest release, Anthem, has received a mediocre critical response and a meager performance on the U.K video game charts following its launch. Perhaps the company is looking for more live service developers and titles in its backlog to broaden their market of free-to-play offerings.